Earlier this week, Star Wars collectible fan site, Fanthatracks, broke the news that Hasbro plans to release another special edition version of their popular Black Series Stormtrooper Electronic Helmet. 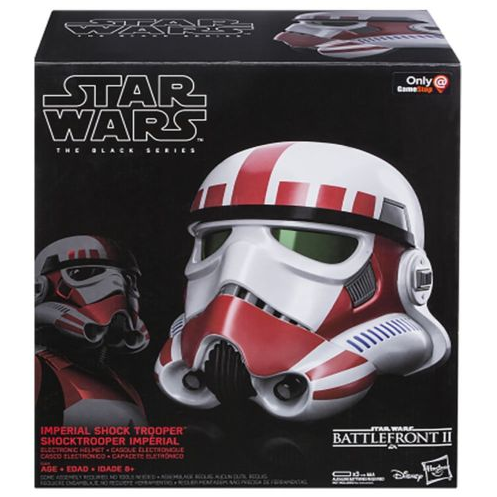 Allegedly a Gamestop exclusive, this Imperial Shocktrooper bucket is the second Stormtrooper helmet from this series to be vendor-specific. Amazon was the first to offer a custom Stormtrooper lid when they worked with Hasbro to bring an all-black Shadow Trooper helmet to market over two years ago. As someone who owns both the Shadow Trooper and the standard Stormtrooper helmets from this series, this announcement doesn’t excite me all that much. I would rather Hasbro develop a Phase 2 Clone Trooper helmet with Shocktrooper markings, but this is obviously much easier for them as the molds for the lid already exist. At the same time, it is encouraging to see this line continue to grow and for collectors, particularly those who like licensed items, this is probably another must-buy. Moreover, it’s my opinion that the Black Series Stormtrooper helmets are the best of Hasbro’s headgear. Speaking of collectability, the Amazon-exclusive Shadow Trooper helmet regularly fetches $150-200 on eBay, which is more than twice the original retail price. If you’re looking for an investment piece, this Shocktrooper edition seems like a safe bet. Availability is yet to be determined, but some eBay sellers claim to have the helmet in-hand already. I’d wait until it hits Gamestop’s shelves. The helmet should sell for around $80.